Okay, so maybe this app won’t quite make you the life of the party. Admittedly, most of the questions are on the more generic side: “What’s your favorite candy?”, “What was your favorite movie when you were young?”, that kind of thing, but as you may have noticed, some of the questions are random/bizarre enough to take any potential for lively conversation and kill it dead. Thankfully, you can easily skip questions you don’t like, or even write your own, but the number of included questions aren’t nearly as many as you’d think for a $2.99 app. 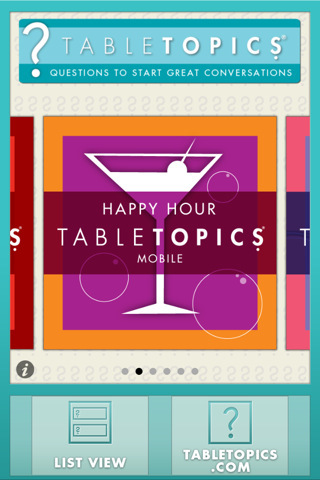 Tabletopics comes with two sets, Starter and Happy Hour, with 60 separate questions each. There’s also the option to purchase additional sets, like First Date and In-Flight, for $1.99 a piece. Now, this is a steal compared to the actual card game which retails at around $25, but that’s still a surprising amount of cash for a handful of digital cards with things like “What’s your favorite dessert?” on them. However, the app is a lot handier than an actual stack of cards, and I will say that Tabletopics has a really beautifully smooth and clean interface that is easy enough for even the most technologically challenged. It has the kind of shiny digital polish that makes it look like a million bucks, even if it’s wrapped around only a nickel’s worth of content. Now, I’m the kind of person who is rarely at a loss for words, but I do get why this app exists. There are a lot of people out there who get shy or tongue-tied and don’t know what to say, and I sympathize. Unfortunately, with the exception of long car rides and possibly slumber parties, this app is the kind of weirdly contrived conversation starter that is going to just take you from being “Awkward Guy” to “Awkward Guy Who Can’t Function Without His iPhone”. AppSafari review of TABLETOPICS was written by Tracy Yonemoto on February 8th, 2011 and categorized under App Store, Chat, Reference, Social. Page viewed 4188 times, 2 so far today. Need help on using these apps? Please read the Help Page.